The striking copper build is finished with an antique brushed effect to give a unique vintage feel to a superior modern design. Moreover, the exclusive flat copper plunger top not only adds even more visual appeal to an already beautiful piece, but makes for a more comfortable experience for your hands. So not only will your taste buds thank you, so will your hands! Compact and light enough to place in a travel bag or backpack and take with you for superior tasting tea or coffee wherever you go! Sturdy enough to use in a dishwasher or wash by hand. The glass carafe is removable and can be safely heated in a microwave to give you the best coffee experience every time! *Note: Refer to best practices printed on box. Detailed instructions for the perfect brew are provided with photos and easy to read text right on the box. We want to ensure you get the best experience out of using the Koffee King French press coffee maker. If this isn't the best coffee you've every had, send it back for a refund! Makes More Than Just Coffee or Tea! Unlike our competitors, the Koffee King coffee plunger was built to be versatile. Use it as a milk frother to make whipped cream, as a tea infuser to brew tea or even to rinse quona. In fact it can be used to strain just about anything from liquid off frozen spinach to broth from mussels! If something happens to your Koffee King within 1 year, we will send you a new one, FREE! The Greatest Coffee Experience Is Now Open! ☕ ELEGANT COPPER BUILD & EXTRA THICK CARAFE - The striking anti-rust copper frame is finished with an antique brushed effect to give a unique vintage feel to a modern design. Enjoy watching your coffee as it's made, but hate that most glass carafe's shatter easily? Not to worry! The King Koffee carafe is made with extra thick reinforced heat resistant borosilicate glass and able to withstand 200 °boiling water without breaking a sweat! ☕ UNIQUE PLUNGER DESIGN - King Koffee's plunger is our exclusive design. We made its flat top extra large to give your hands a break while you wait for your cup of joe to percolate. We also made the entire plunger extra tough, built with 18/8 (304) FDA approved stainless steel unlike inferior designs. So not only will your taste buds thank you, so will your hands! There is simply none other like it! Our bonuses don't end there. Our package comes with 2 EXTRA Filters and 1 FREE scoop! ☕ THE BEST COFFEE YOU'VE EVER HAD OR YOUR MONEY BACK! - With a 34 oz (1000 mL) capacity, make up to 8 cups of coffee unlike any you've ever had. Don't take our word for it, try it yourself! Whether it is coffee, tea, expresso or even cold brew, we guarantee the highest quality beverage! Until you've tried our Koffee King french press coffee maker, you've not tasted coffee! Don't believe us? If this isn't the best tasting coffee you've every had, send it back within 30 days for a full refund! ☕ MAKE WHIPPED CREAM! - We know you want the most out of your money. That's why we built Koffee King to do much more. Use it as a milk frother to make whipped cream, as a tea infuser to brew tea or even rinse quona. In fact it can be used to strain just about anything from liquid off frozen spinach to broth from mussels! Scared to try new things? 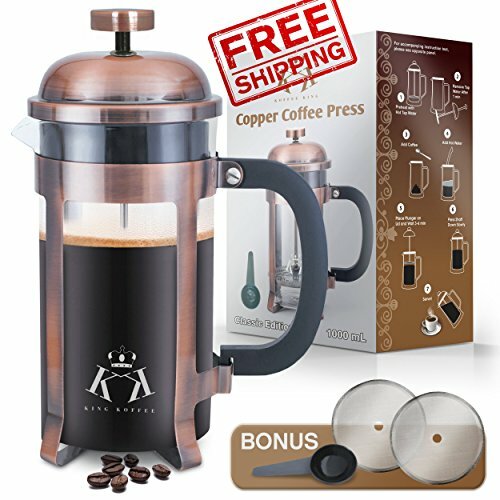 If something happens to your original Koffee King french press coffee maker within our 1 year warranty period, we will send you a new one, FREE! ☕ PREMIUM QUALITY AT A DISCOUNTED PRICE! - Due to the expensive copper material, generous sized carafe and thicker borosilicate glass, this exquisite french press is normally priced at $65.95. However, for an extremely limited time we are offering the King Koffee coffee plunger at a ridiculously discounted rate of 55% OFF! We've set aside a fixed number of discounted units, so please HURRY before the offer ENDS! Note: Once our promotional units are gone, we will raise the price back to $65.95.